As electric scooters roll out in more and more cities across the country, Elon Musk told Recode editor Kara Swisher recently that the electric scooter “lacks dignity.” The Tesla CEO noted that Swisher was “laboring under an illusion” if she really thought she looks great while riding one. Musk’s reaction may come as a surprise to some observers, but let’s be honest: Musk is a car man. Sure, he wants us all to switch from using internal combustion engines to batteries, but at his core Musk believes that automobiles should continue to dominate the transportation system. That flies in the face of growing recognition that truly sustainable mobility — which will be necessary to avoid the worst-case climate-change scenarios — will require far more than simply switching to electric cars. Truly sustainable mobility — which will be necessary to avoid the worst-case climate-change scenarios — will require far more than simply switching to electric cars. Remember that Musk doesn’t like public transportation — he’s called it “painful” and said that other passengers could be serial killers — and wants to build a system of tunnels that could be “10, 20, 30 layers deep (or more)” below Los Angeles so people can keep using cars without getting stuck in traffic. There are a lot of questions about this proposal — the cost savings he promises only he can deliver have already been achieved in other developed countries and his proposed car elevators seem like they would create terrible bottlenecks — but what about the human cost of continuing on an auto-dominated path of development? We accept the status quo because, in most cases, it’s all we know, but it actually has terrible impacts on our health. Between 1980 and 2014, the average commute increased nearly 20 percent to 26 minutes each way and the number of “megacommuters” — people who travel 60 to 90 minutes each way — has increased 64 percent since 1990. The longer the commute, the worse the health impacts. Driving more than ten miles each way has been associated with higher blood sugar, cholesterol and depression, according to a report in the American Journal of Preventative Medicine; while the U.K.’s Office of National Statistics linked commutes of more than 30 minutes each way to higher rates of anxiety, lower levels of happiness and less life satisfaction. And that’s before we even start talking about the lethal outcomes. In 2017, more than 40,000 people were killed in collisions with cars — more than the number of Americans who were killed with guns in 2016 — and that doesn’t even count the additional 53,000 premature deaths attributed to tailpipe emissions. It’s shocking how little outrage there is about vehicle deaths when compared to the growing coalition for gun control. Nevertheless, shifting away from automobile dominance in urban centers is becoming ever more realistic. Over the past year and a half, electric bikes and scooters (collectively part of the micro-mobility movement) were dumped on the sidewalks of cities across the country. In some places, there was backlash, and rightfully so. Few cities have dedicated lanes for bikes and scooters, yet all of a sudden there were far more people using them, usually in the very limited space allotted for pedestrians. Anger was to be expected, and government action soon followed. But whereas Uber and Lyft fought local governments tooth and nail to escape regulation, dockless bike and scooter companies have been generally more cooperative — it’s a lot easier to send a municipal employee around in a truck to impound a bunch of scooters than to do the same to Uber drivers. As a result, cities have been able to better regulate these new companies to limit the number of bikes and scooters on their streets, set speed limits, and demand trip data that they’ve had so much difficulty getting from ride-hailing companies. 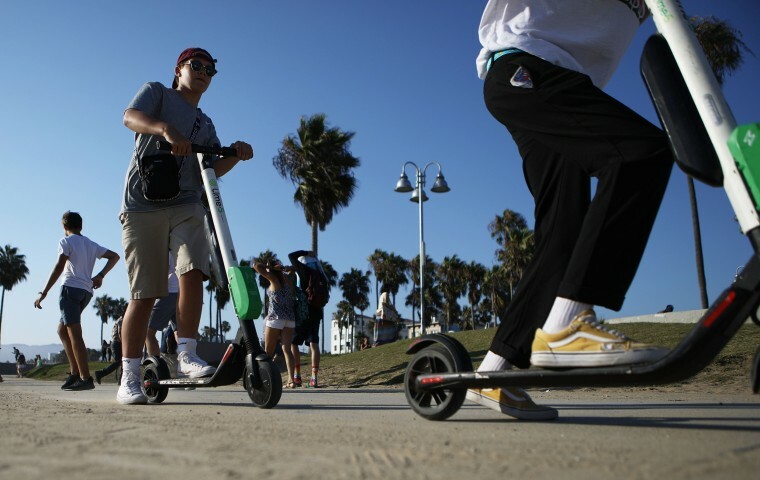 Cities have also been adapting to the new forms of mobility in their midst: Santa Monica installed special parking spaces for dockless bikes and scooters to ensure they aren’t cluttering sidewalks. Hopefully in the near future, cities will install more bike lanes. Making streets safer for dockless bikes and scooters could also have benefits for underserved communities. Black residents of Washington, D.C. are far more likely to use dockless bikes than the city’s docked bike-share service, according to mobility data company Populus, which also found that women and people with low incomes may be more likely to use scooters in major U.S. cities. Electric bikes, which are often part of these dockless services, have also been shown to be particularly attractive to drivers in Australian, Canadian, and U.S. cities in a review of recent research by Elliott Fishman and Christopher Cherry, and switching from cars to e-bikes would result in significant health benefits. It makes sense though. E-bikes require less work than a conventional bike, meaning fewer riders need a shower afterward, they make conquering hills much easier, and they’re faster than regular bikes (and cars stuck in traffic) so riders can use them for longer trips. Plus, the environmental footprint of a bike or scooter — electrified or not — is far smaller than a car, and when the City of Copenhagen measured the cost to society of transportation, including things like safety, tourism and health, it found that every kilometer (0.62 miles) of cycling produced a 26-cent economic gain for society, while each kilometer driven cost 14 cents. In the Netherlands, high rates of cycling prevent 6,500 premature deaths every year and save the country $23 billion, according to a study in the American Journal of Public Health. The United States holds freedom as its highest value, but forcing people to use cars to get around isn’t freedom at all. Of course, the Netherlands has both fewer people and higher rates of cycling than the United States, but that doesn’t mean U.S. cities can’t change. In the 1960s, the Dutch government razed neighborhoods in Amsterdam and other cities to make way for the automobile, following in the footsteps of their American counterparts. However, activism in the early 1970s forced the government to reconsider this strategy. Let’s be clear: Cars aren’t going to be abandoned tomorrow. They’ll continue to have an important role, especially outside urban cores, for years to come. But improving city public transit systems, widening sidewalks and giving dedicated space to micro-mobility options would make our lives easier and build activity into our daily routines, to name just two immediate benefits. The United States holds freedom as its highest value, but forcing people to use cars to get around isn’t freedom at all. True mobility freedom would mean providing citizens a range of options to get around cities, with reliable public transit and safe micro-mobility as convenient, less costly alternatives to cars. Instead of fighting against the influx of bikes and scooters — or deriding them as uncool or undignified — we should embrace them. And frankly, given the high cost of automobility and the pressing challenge of climate change, holding onto the status quo is the worst possible option.